Electric Avenue | The Music Issue | Style Weekly - Richmond, VA local news, arts, and events. 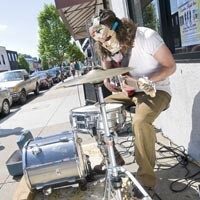 Busking brings public music and a skull mask to Richmond&apos;s streets. Four months ago, Jon Ramsey was laid off from his job as a furniture maker. Since then he&apos;s been regularly performing with his acoustic guitar as a busker outside of an empty storefront in Carytown. The most money he&apos;s ever brought home is $30, but most of the time it&apos;s more like $10, if anything. Although Ramsey sometimes performs near Virginia Commonwealth University, he says that Carytown is the liveliest spot for busking in Richmond. A sunny day there draws all kinds of street musicians, some looking to make money, others performing just for fun. Buskers might be said to represent a microcosm of the local music scene, where smaller bands often still have problems finding a place to play and most musicians need to work at least one other job to make ends meet. Some musicians have busked Carytown for years. Harry Gore plays with an electric guitar and microphone, even on days when it&apos;s so hot that the direct sunlight wreaks havoc on his strings. Gore was known in the &apos;80s for the local rock group the Good Guys, and says he began playing Carytown years ago because he was broke. He still plays in several different local bands and works a day job at a Christian bookstore. “The idea is to not be obnoxious,” Gore says — “not turn up too loud, and be respectful.” Even in today&apos;s worsening economy, passersby are still willing to give “a buck or two” to street musicians, he says. But he&apos;s found that Charlottesville tends to treat its buskers a little better, especially along the downtown mall. Which raises an issue here: Musicians don&apos;t have many places to go in Richmond. They once thrived in Shockoe Bottom, but Gore acknowledges that area&apos;s not the bustling place it used to be. “A lot of the clubs and buildings are boarded up and it seems to be drawing the wrong element,” he says. There is no loitering law in Richmond, but if the musicians&apos; noise levels get too high, police move in and tell them to turn it down. Tom Suddeth, president of the Carytown Merchants&apos; Association and owner of Carytown Bicycle Company and Roadrunner Running Store, says the organization has never even discussed buskers to his knowledge. A fairly new star on what we&apos;ll call the busking circuit — working Carytown as well as First Fridays — is the one-man-band known as Gull, aka Nathaniel Rappole. Usually set up outside of Plan 9 Music, where he used to work, or Chop Suey Tuey, Rappole is difficult to miss: He wears a homemade skull mask rigged with an old telephone microphone, and bangs away on a small drum set while simultaneously hammering distorted, bluesy riffs on electric guitar. The ambidextrous Rappole, 28, lives in Jackson Ward and tours regularly with punk bands Ultra Dolphins and Snack Truck. Rappole used to be a puppeteer in West Philadelphia and moved to Richmond two years ago. He says there have been complaints about his noise level as a busker, so he learned to adapt by playing drums only with his bare hands and sometimes muting the cymbals with T-shirts. He&apos;s held a myriad of wide-ranging jobs since coming to Richmond — working on a farm and being a caretaker for a woman whose husband had Alzheimer&apos;s disease — but he&apos;s always relied on the extra income from busking.